This event is such a wonderful one, as it encourages us to use a lot of seeds in our daily menu. I am sure no needs any definition or introduction to what seeds are. Of course, there are some seeds which cannot be consumed, but there are many more which can be. Here is a list per Wikipedia and I am sure, there are many more. Before coming to USA, I did not know a lot of seeds we could eat. But, I have learnt so much and started using a lot in our regular menu. For the event, I have selected one of the lesser known seeds called Flax Seed. The first time, I heard about this seed was when doctor suggested my hubby to use it for constipation issues as it is very fibrous. Then, once I became a regular blogger, I saw a lot of Vegan people using flax seed in powder form as a substitute for egg and I was surprised by it. Then, there were a few of our creative bloggers, who have even used it in various kind of masala powders and such. Can you believe that in little less than 1/2 cup (8 tbsp) of flax seeds, you get about 27.3 gm of fiber and you only need an average of 17-20 gm of fiber per day? How neat is that? So, all my readers (bloggers and non-bloggers alike), put your thinking cap and whip up some wonderful recipes with these Flax Seeds as star ingredient (if not star, at least a major ingredient). Here are some simple rules you need to follow. 1)Cook anything with flax seeds. ONLY vegetarian dishes (eggs are allowed, only if used in baking) are accepted from today to 28th February 2011. 2)Post as many dishes as u can in your blog from today onwards. Many entries per person are allowed. 3)Link back ur entry to this announcement page. 4)If u have any interesting tips its will be so useful, dont forget to send. 5)I'll accept the old entries, if they are reposted with this page link. 6)Using Logo is very much appreciated. Please take care to send all ur delicious entries before 28th February 2011. 8) If u dont have blog, no problem. Please do send ur entries to the above mail address, i'll include them while doing the roundup. If you are interested in hosting the event in future, feel free to contact Priya. I'm new to blogging and came across your site, I'm interested in taking part in this event but am unclear on the rule.....whether to use flax seeds, sesame seeds or any seeds? Happy hosting, let me see what i can come up with. 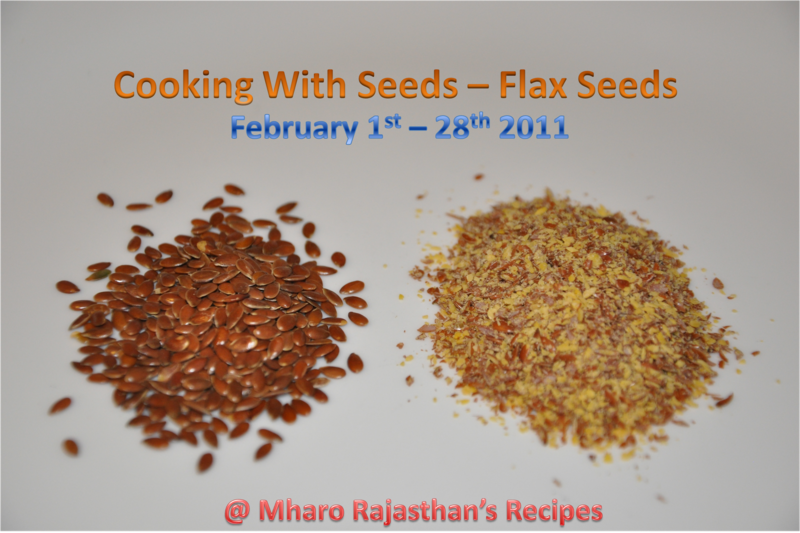 I have never used flax seeds..let me think of adding them to some dish... will post the recipe soon...also looking forward to see many other flax recipes at the end of the event. I cant thank you enough for picking Flax seeds for this month's CWS event. I have a big bag of flax seeds I bought for my daughter but didnt use it. Hopefully, I will send you atleast a few entries for your event. Happy hosting Priya,great event,love flax seeds. Thanks for hosting Priya, will send my entries definitely..
Hi Priya.. sent in an entry..